Anyone who works in the dairy industry will be aware that there is tremendous variation in maternity pen design. Part of the reason for this variability is a lack of research on what types of environments are best for the cow while she is giving birth. Research at UBC has now recruited the cows’ help in designing more appropriate maternity pens, by conducting a series of ‘preference’ experiments in which we allow the cows to vote with their feet. Below we describe the results of three different preference experiments designed to determine what features are important in the design of maternity pens. Photo 1: The experimental maternity pen that gave cows the option between a hide and open pack. Earlier work on feral and extensively managed cattle tells us about the choices cows make in the natural environment. Cows typically will leave the herd to find a secluded area to give birth; for example, an area of tall grass, or bushes with soft ground cover. From these observations, we hypothesized that indoor-housed cows are motivated to seek seclusion from herd mates (and other perceived threats), and will use a ‘hide’ if given the choice. To test if cows are motivated to ‘hide’ at calving, we reconfigured our pens at the UBC Dairy Centre in Agassiz, BC. The experimental maternity pens gave cows the choice between an 18 m2 open sawdust-bedded pack and a 15 m2 sawdust-bedded pack surrounded by a 1.5 m high wall that provided a visual barrier between the cow and the rest of the barn (Photo 1). This design was not intended to be practical, but to provide a test of the idea that cows want to ‘hide’ around the time of calving. Cows entered the experimental maternity pen at least two days before calving to ensure that they were familiar with both areas. Using video cameras, we recorded where the cows spent their time before and during calving (24 hours per day). Cows calving at night, when the lights in the barn were off and no staff were present, showed no preference between the two packs. However, cows calving during the daytime showed a strong preference for calving inside the hide. Of the 16 cows that gave birth during daylight hours, 13 chose the seclusion of the hide. Cows that calved in the hide started to use it about eight hours before calving, likely near the start of labour. Given these promising results, we wanted to test if cows would seclude themselves from herd mates when housed under more practical conditions. We used more conventionally sized individual maternity pens that were directly adjacent to a close-up group pen (this study was in collaboration with researchers at the University of Arhus, and took place in Denmark). To create both a ‘covered’ and ‘uncovered’ side to the maternity pen, we attached a 1.5 m high piece of plywood to half of the front of the pen (facing the close-up group), as well as to both sides (Photo 2). Again we video recorded where cows chose to calve; and, again, the preference was clear: of the 19 cows used in this experiment, 15 (79%) calved in the covered side of the pen and only four calved on the uncovered side. 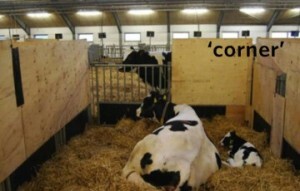 Photo 2: Individual maternity pen retrofitted with a covered ‘corner’ that gave cows the option to hide. 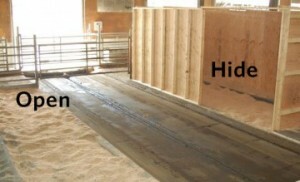 The final preference study examined flooring properties that are important to cows at the time of calving. More than a decade of research—much conducted at UBC—has shown that the bedding surface is the most important determinant of cow comfort for lactating cows. Cows strongly prefer dry, deep-bedded surfaces, regardless of the type of bedding used. Dry, deep bedding is also the most powerful protective design feature in reducing lameness and especially hock lesions on dairy farms. Based on this information, we decided to ask indoor-housed Holstein dairy cows which surface they preferred during calving. In this experiment, we created a maternity pen with three flooring options: 1) concrete, 2) pebble-top rubber mats, and 3) 10 cm of sand; each were covered with a 15 cm layer of straw. We made a large maternity pen that was divided into three sections partitioned with wooden boards; each section had a different flooring surface. Cows were moved into this pen at least two days before calving to ensure that they had previous experience with each of the flooring types. After every third cow, the location of each surface was alternated to control for the chance that cows had a preferred side of the pen. Using video cameras, we recorded where cows spent their time the day before calving, and where they chose to calve. Of the 17 cows in the study, 10 calved on sand, six calved on concrete and one calved on the rubber mats. Cows also generally avoided the rubber mats on the day before calving. These results tell us that rubber mats were the least preferred flooring option for dairy cows when housed in the maternity pen, despite being bedded with a thick layer of straw. The results of our preference tests indicate that even our modern, indoor-housed dairy cows are looking for a secluded place to calve, perhaps especially in busy barns and during busy times of the day. It was also clear that rubber flooring is not preferred by cows at calving. 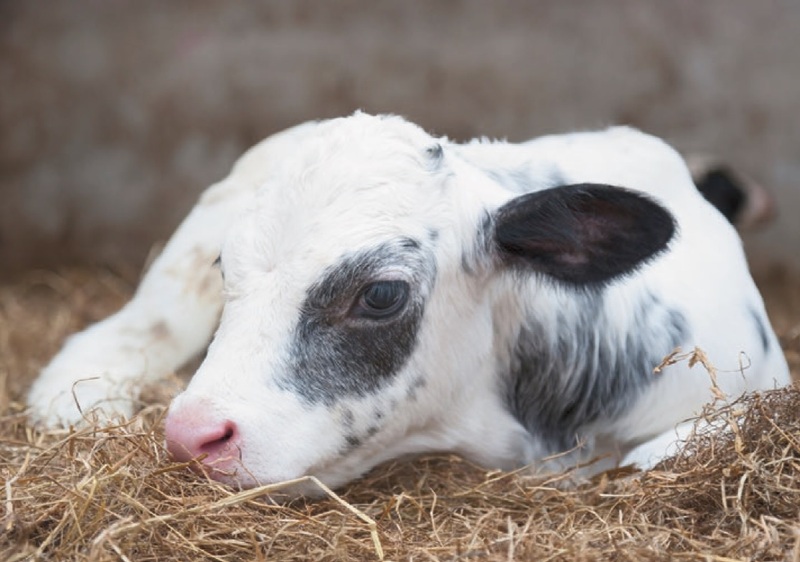 The next steps are to determine if there are other benefits to allowing cows to have a preferred maternity pen, such as reduced calving problems like dystocia or stillbirths. For now, we encourage producers to look with fresh eyes at their maternity housing, keeping cow preferences for seclusion in mind. We are grateful to Magnus Campler and Katy Proudfoot for their help in preparing this report. For further information please Email marina.vonkeyserlingk@ubc.ca or dan.weary@ubc.ca. This report is based on research published in the Journal of Dairy Science and the Journal of Animal Science. We thank the researchers and staff of the UBC Dairy Education and Research Centre and Aarhus University who collaborated in the work described in this report. 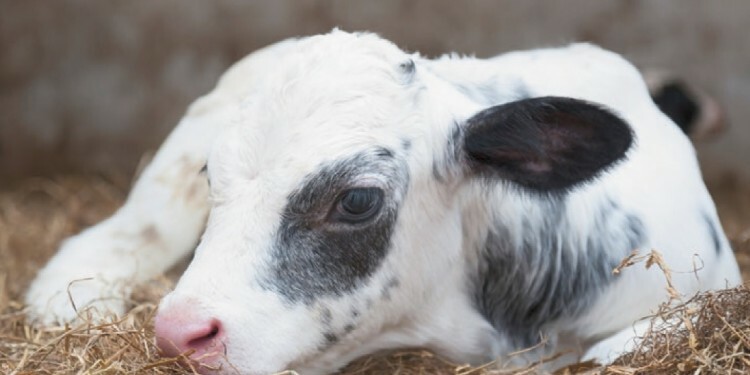 The research by members of UBC’s Animal Welfare Program was funded by NSERC, the Canadian Dairy Commission, Dairy Farmers of Canada and many others listed at http://awp.landfood.ubc.ca/. In our November, 2015 issue of Modern Agriculture we share another cow comfort story…and this one involves water beds in the barn! SIGN UP NOW for your FREE subscription.